I will be going over some basic radiographic appearances of periodontal health and disease for the next few weeks. This first week is a starter on normal radiographic appearances of periodontal health. The two intraoral radiographs that are used for periodontal assessment are bitewing radiographs and periapical radiographs. Of these two, bitewing radiographs should ALWAYS be evaluated first (if they are available). 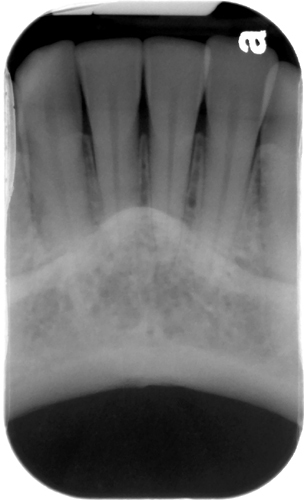 The reason for this is the vertical angulation of bitewing radiographs is closer to 0 degrees whereas periapical radiographs tend to have a large vertical angle of 30 degrees or more. The closer the vertical angle is to 0, the better the radiograph will provide an accurate representation of where the bone level is in relation to the cemento-enamel junction. 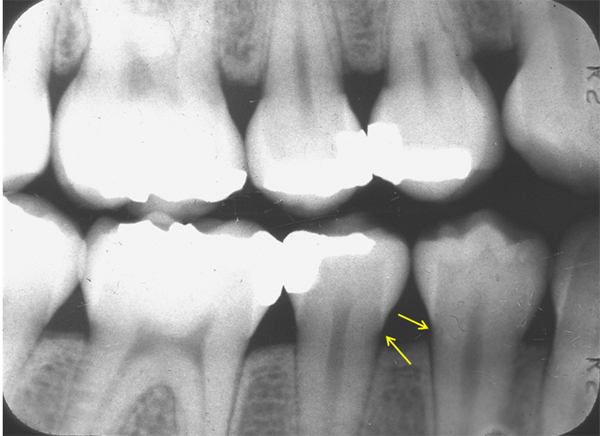 Look at the example radiographs below specifically where the bone appears in relation to the cemento-enamel junction of the maxillary molars. The range of normal bone levels are when the crest of the alveolar ridge is 0.5 to 2.0 mm apical to the cemento-enamel junction. In the anterior region, the crest of the alveolar ridge may have a pointed appearance due to smaller interproximal spacing between the teeth. In the posterior region, the crest of the alveolar ridge will be flatter. When evaluating the bone level in the posterior follow these steps. 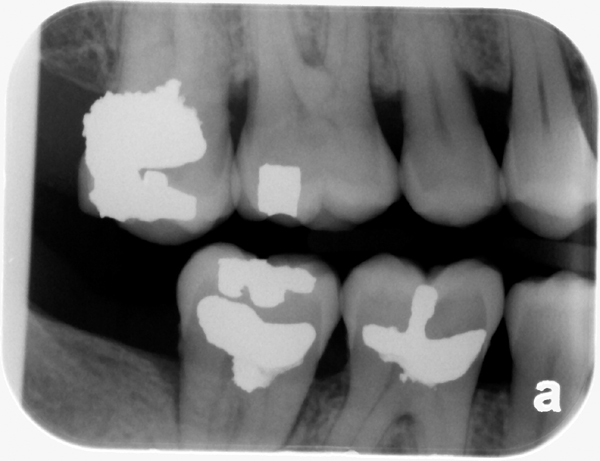 Identify the location of the cemento-enamel junction of two adjacent teeth. Imagine a line between these two points. Compare this line to the line of the crest of the alveolar ridge. If both of the lines are parallel and the bone is 2.0 mm or less apical from the cemento-enamel junction, this is normal horizontal bone levels between the two adjacent teeth. 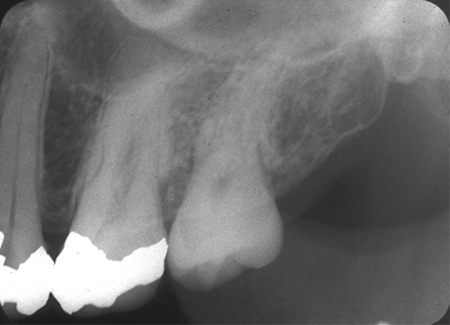 Beware of when the crest of the alveolar ridge appears angled as it does not immediately indicate abnormal bone loss as seen on this bitewing radiograph between the mandibular premolars (follow the above steps and you will note that the crest of the alveolar ridge is within the range of normal). The coming posts will define what to interpret when the lines are not parallel or more than 2.0 mm apical from the cemento-enamel junction. This last category is primarily about the periodontal ligament space and lamina dura at the crest of the alveolar ridge. As the periodontal ligament space approaches the crest of the alveolar it tends to widen slightly due to everyday occlusal trauma (i.e. chewing, bruxism, clenching). This is within the range of normal if it is a slight widening and not starting to pull away from the tooth creating a radiolucent triangle. Note the slight widening of the distal of the maxillary second premolar (arrow). 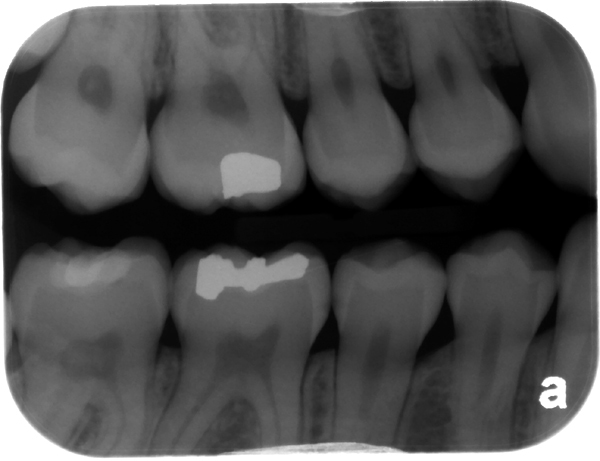 On this radiograph, note the slight widening of the distal of the maxillary first premolar. The mesial of the maxillary second premolar is triangular in shape and abnormal bone loss (to be covered in coming posts). If you have any questions or comments, please leave them below in the comments. Thanks and enjoy! Thanks Dr G. Your radiography is amazing. It is great for us to prepare for the CA NDEB exam. Hopefully more caries teeth and periodontal diseases coming soon. 1) Vertical bitewings are an excellent tool to evaluate bone levels. However lately I’ve been impressed by the quality of the “extraoral bite wings” that some modern panoramic machines offer. What do you think about it? 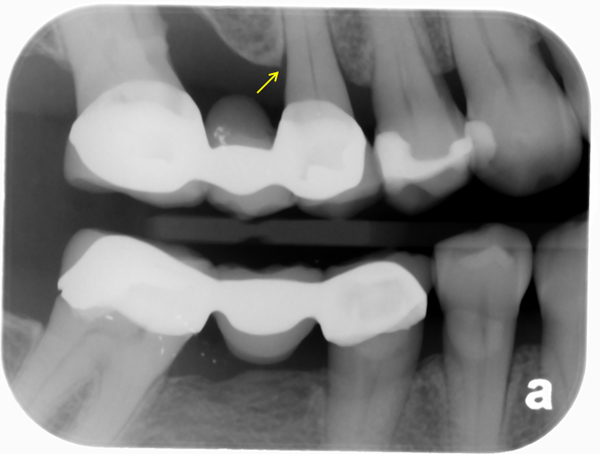 2) When you discussed about the normal radiographic appearance distal to the maxillary second molar, would you consider that to be the so called: “furcation arrow” described by Hardekopf? Furcation arrow is not a very sensitive diagnostic tool, but I think it should make us suspicious of a possible furcation involvement. Thanks for the great questions. 1) As for extraoral bitewing radiographs I’ve heard both that they are good and that they are bad. 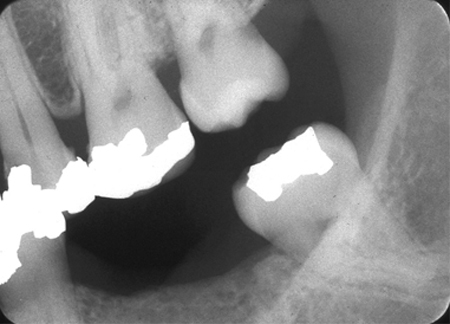 I haven’t seen all the newest research so I think that may be a good post on extraoral bitewing radiographs versus intraoral bitewing radiographs. 2) I’m not too familiar with ‘furcation arrow’ so I will need to look into that more before I can give an informed response.